A historic railway cottage in Santpoort-Noord, The Netherlands was recently restored and expanded by the creative team at Zecc Architects. Bordered by the railway line between Amsterdam and IJmuiden on one side and by the National Park South Kennemerland on the other, the residence takes in its landscape with its newly developed architecture: “The picturesque railway house is almost brutally shot through with a large Cortensteel volume. On two sides an extension is achieved with hard lines and large glass surfaces, which focuses on the surrounding greenery. The small railway house literally breaks through its ancient walls outside and provides new insight into the landscape. The old railway cottage is on the inside almost unchanged. The remains of numerous alterations have been removed, leaving a pure and characteristic brick cottage. 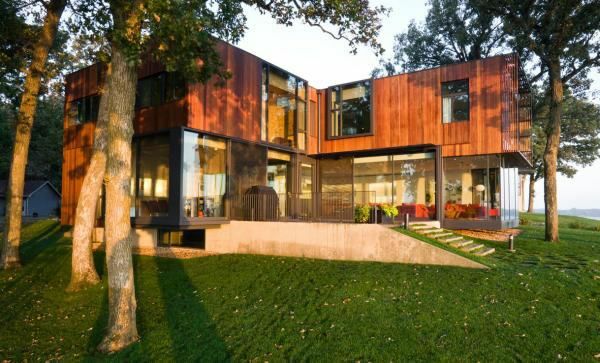 This old section provides security and simultaneously connects all contiguous open spaces of the house”. According to the architects, the design metamorphosis was inspired by the contrast between the existing straight metal rails and the softness of the surrounding dunes.